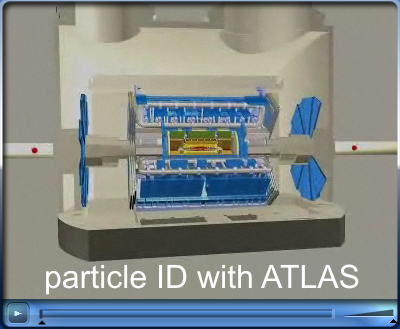 Here, you'll learn about the structure of the ATLAS detector and how particles interact with the detector material. You can decide whether you want to learn this with the help of videos or texts. 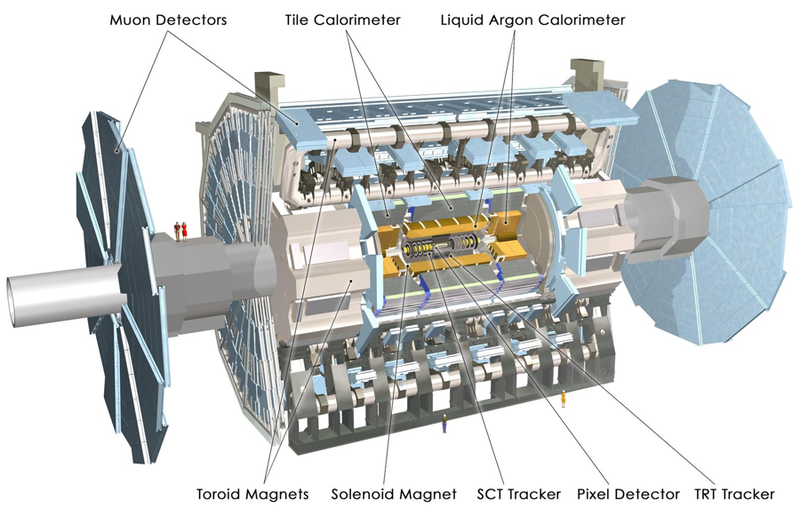 Products of proton-proton collisions are detected by the ATLAS detector (ATLAS stands for A Toroidal LHC ApparatuS). In the middle of ATLAS, two particle bunches (each with 100 billion protons) collide with each other after they have been accelerated in opposite directions in the LHC. It is therefore not possible to predict which parts of one proton will collide with which parts of another one nor can we tell which protons collide at all. When protons collide they may simple scatter off each other but stay whole or they will interact more violently and disintegrate. In the latter case, new particles are formed. From the data, physicists are able to say which physical processes may have taken place during the collisions. To do this, they need a good understanding of the detector and its function. So let's take a look at these points, below. In the following picture gallery, you'll find a short description of the structure and function of each part of the detector. The ATLAS detector is a multi purpose detector. It is used at the Large Hadron Collider (LHC) to look for new insights into how the universe was formed and of what it is made up. With the help of the ATLAS detector, physicists want to detect particles formed during proton-proton collisions and determine their properties. These properties are, for instance, momentum, electric charge, and energy. For this, a detector was built, which has a breathtaking size: a length of 44 meters and a diameter of 25 meters. The detector consists of different detector elements, each has a specific task. They are arranged in an "onion-skin" structure around the beam pipe in which the protons circulate. The trackers detect particles with electric charge. They measure their positions at different times. Since the trackers are permeated by a homogeneous magnetic field, charged particles are deflected. With the help of the curvature one can calculate the momentum and determine the electric charge. The interaction between the particles produced during the collision and the detector material of the trackers is very small. Thus particles only deposit a small amount of energy there. In the electromagnetic calorimeter (LAr electromagnetic barrel), particles and their antiparticles, which interact electromagnetically, are detected. These are mainly electrons and photons. The whole energy of a particle flying through the electromagnetic detector is absorbed and transformed into an electronical signal. The strength of the signal is a measure for the energy of the particle. 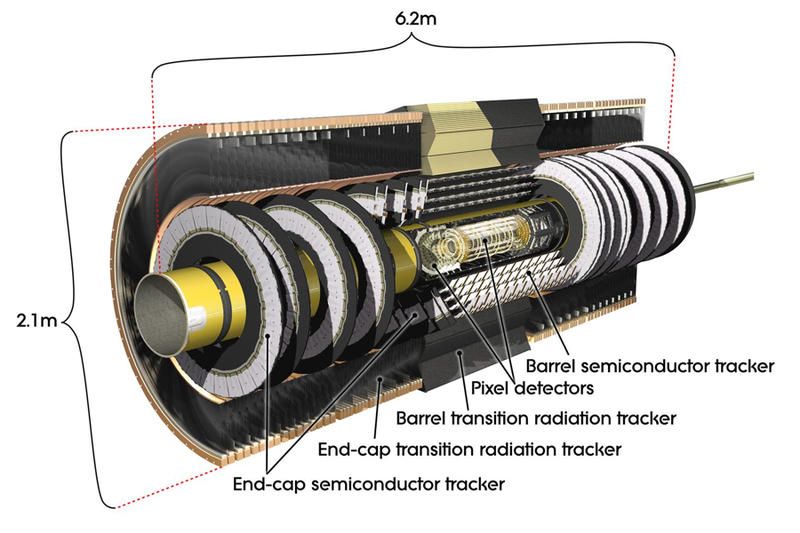 In the hadronic calorimeter (Tile barrel), strongly interacting particles, that are built up of quarks and/or antiquarks, – so-called hadrons – are detected, for example protons or neutrons. 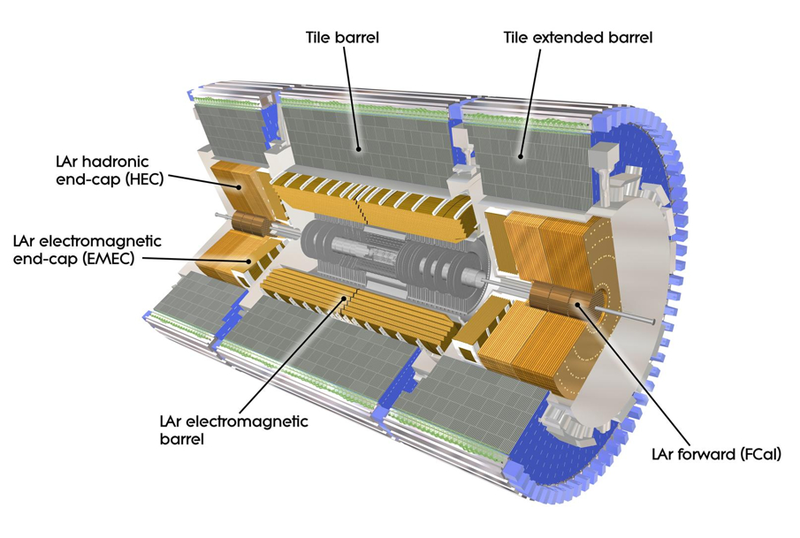 Muons deposit only a small amount of their energy in the calorimeters, and are the only "visible" particles which pass through every layer of the ATLAS detector. 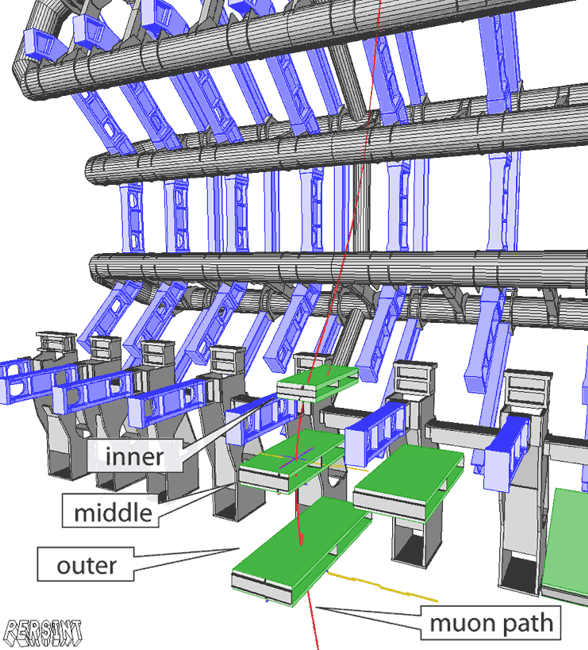 Therefore, there are muon chambers located at the outermost part of ATLAS to identify muons. The muon chambers are situated in an additional magnetic field to measure the momentum more precisely than with the trackers. This magnetic field is produced by huge toroidal coils (thus the "T" in the name "ATLAS"). The muon chambers are made up of thousands of long tubes filled with gas. There is a wire in the middle of each tube. Incident muons create free charge carriers in the gas via ionisation. These carriers move towards the outer wall or towards the wire because of a large voltage difference between the tube and the wire, thereby creating an electronically readable signal.